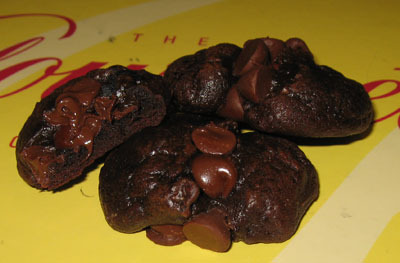 This morning, I baked up some chocolate truffle cookies. The recipe is here on Recipezaar and you can also find it on page 153 of the Gourmet Cookbook. The dough keeps well. In fact, I made it last week, and the truffle cookie dough balls have been wrapped in foil in my refrigerator for at least 6 days. They baked up just fine, so we can throw that recipe in the “Good Make-Aheads” file. Here’s a photo. Boy, these were good.